The figure $756 million represents many different things to many different people. To sports fans it is the unfathomable amount of money the NFL paid to settle the now infamous concussion lawsuit brought by more than 4,500 former players. To the NFL it is pocket change, compared to the billions of dollars it faced in potential liability, to keep a lot of unsavory documents and testimony out of the public domain. To the players themselves, it represented a start, but probably will not provide any real help to those suffering the long-term consequences of repeated brain trauma or chronic traumatic encephalopathy (CTE). Yet while the NFL settled its concussion mess for the time being, the NHL should look at that $756 million settlement and hide under the bed. In the coming years no full-contact professional sport will be immune from the realities of concussion litigation. Every league will have its price — even the all mighty NCAA is facing its own massive concussion lawsuit. However, the NCAA, NFL, MLB, and NBA all have television deals worth more than $1 billion annually. The NHL only receives $200 million per year, meaning a massive litigation verdict would cripple the league. $756 million could be the straw that breaks hockey’s back. Such a doomsday scenario is one step closer to reality thanks to a lawsuit filed by the estate of former NHL enforcer whose sole job was to spread doom on the ice. The family of former New York Rangers and Minnesota Wild forward Derek Boogaard filed a wrongful death suit in the Illinois Cook County Circuit Court in May alleging that the NHL is responsible for his brain damage and subsequent addiction to prescription painkillers (full text below). The defendants named in the lawsuit include the NHL, the NHL Board of Governors and league commissioner Gary Bettman. 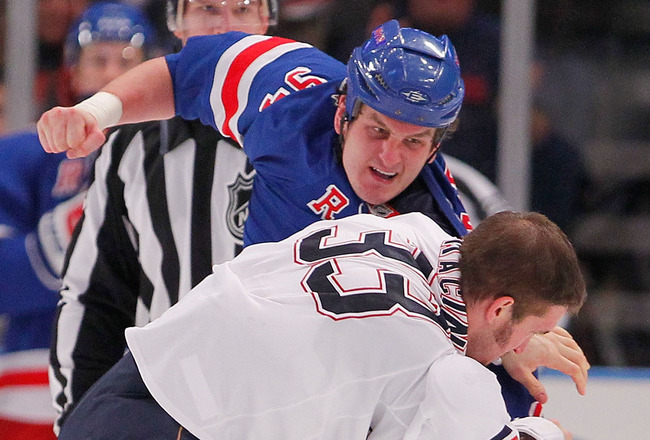 Boogaard, nicknamed The Boogeyman, died from a painkiller overdose in 2011 at the age of 28. Now that football put a hefty price tag on concussions a few weeks ago, the Boogaard lawsuit should strike fear into the NHL as training camps open nationwide. Although the Boogaard estate’s attorney, William Gibbs, of the Chicago-based law firm Corboy and Demetrio, has only pled the jurisdictional minimum of $50,000, if he can prove that the NHL was negligent in treating Boogaard, the damages will almost certainly reach seven figures. 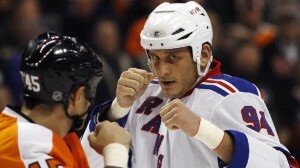 More importantly, if Boogaard’s estate can prevail, it will open the door to many more lawsuits in the future. After Boogaard fractured a tooth, NHL staffers wrote prescriptions for 432 pills of the narcotic pain reliever hydrocodone, which is used in Vicodin, in a single month. During a 16-day period after the 2008-09 staffers prescribed more than 150 pills of Oxycodone. Boogaard received 13 injections of Toradol, a drug that masks the body’s ability to feel pain. From 2008-09, NHL doctors and staffers gave Boogaard prescriptions for 1,021 pills. On April 4, 2011, Boogaard was so impaired at a New York Rangers practice that he could not stay up on his skates and fell numerous times. The NHL will certainly offer a strong defense that it did not know Boogaard was addicted to painkillers and could not have foreseen his untimely death. Procedurally, the NHL, like the NFL did, will seek to remove the case to federal court, then argue, again, like the NFL, that the collective bargaining agreement pre-empts the lawsuit. Boogaard’s estate will have to prove by a preponderance of the evidence that NHL medical staff caused him to become addicted to painkillers, knew about his addiction, and continued to give him the prescriptions that ultimately killed him. Many of these prescriptions, including sleeping pills and muscle relaxants, were written with no specific injury or reason noted. Additionally, a post-mortem study of Boogaard’s brain by the Boston University School of Medicine, Center for Study of Traumatic Encephalopathy revealed that Boogaard had Stage II CTE as a result of the repeated blows to his head in hockey. That CTE diagnosis and the seemingly unprofessional conduct by NHL medical personnel could give this lawsuit strong enough legs to withstand the best defense lawyers Gary Bettman can hire. So while you focus on football this fall, keep an eye on the Boogaard lawsuit as the NHL might have to pawn Lord Stanley’s Cup to pay the litigation bill.